"It only lasted about a millisecond," says Ashcraft, "but it was definitely there." This is an example of an ELVE (Emissions of Light and Very Low Frequency Perturbations due to Electromagnetic Pulse Sources). First seen by cameras on the space shuttle in 1990, ELVEs appear when a pulse of electromagnetic radiation from lightning propagates up toward space and hits the base of Earth's ionosphere. A faint ring of light marks the broad 'spot' where the EMP hits. ELVES often appear alongside red sprites. 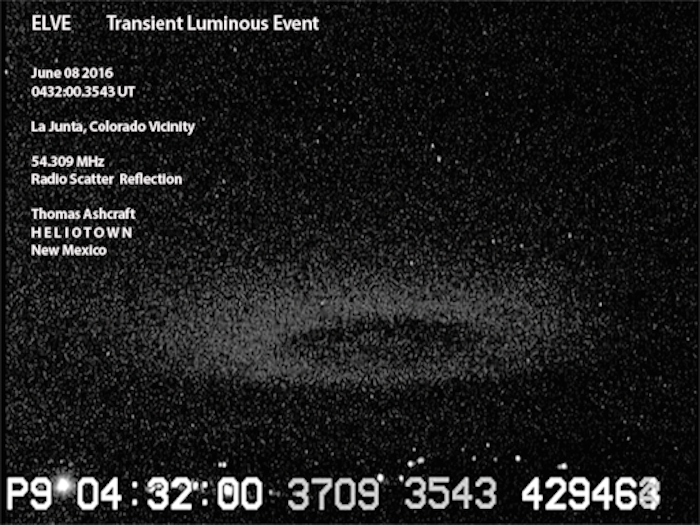 Indeed, Ashcraft's camera caught a cluster of sprites leaping straight up through the middle of the donut. "Play the complete video to see the sprites," says Ashcraft. ELVEs are elusive--and that's an understatement. Blinking in and out of existance in only 1/1000th of a second, they are completely invisible to the human eye. For comparison, red sprites tend to last for hundredths of a second and regular lightning can scintillate for a second or more. To catch an ELVE, a high-speed video camera is required. Stay tuned for more captures as thunderstorm season unfolds.